Current flight arrangements have me leaving on June 3rd at 6:25 PM for London Gatwick. I will arrive there at 7:30 AM on June 4th, take the shuttle to Heathrow and fly out that evening at 7:20 PM for Dar Es Salaam, Tanzania. I will arrive in Dar Es Salaam at 7:00 AM on June 5th and hang out there until the one hour flight to Pemba at 4:15 in the afternoon. The departure is a little less eventful. I will depart August 15th from Pemba to Johannesburg at 1:50PM and after stopping in Maputo land in Johannesburg at 6:30PM and leave at 9:15 for the 11 hour flight to London. I arrive in London again at 7:30 in the morning, take the shuttle to Gatwick and a 12:20PM flight out of London to arrive in the ATL 9 hours later! This flight is $2,272. I really wanted to take the easy route and get the nonstop Delta flight,"keeping Delta My Delta!" 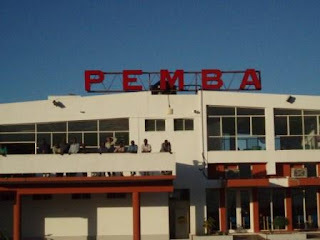 but that forces an overnight stay in Johannesburg there and back (at least $150.00 a night and I will most likely be traveling alone) and makes it almost impossible to get to Pemba via LAM airlines. I have to go through a travel agency to book this LAM flight and the flight only goes out from Johannesburg 3 times a week and costs about $700.00. So the luxury of the nonstop flight and obtaining the extra skymiles is not really a possibility at this time. This flight is 100% refundable and I can make changes if necessary! So this looks like this is what I need to do. You can see Jesus in the eyes of the dying, the broken and the lost. He came with ceaseless love for both the one and the masses. Now we must do the same: stop for the one but believe for the multitudes. We are called to carry His glory. First, we must lie down so that whole nations can come to Jesus. -Live with a company of abandoned, holy and whole-hearted lovers at the Iris Ministries center in Pemba, Cabo Delgado, Mozambique. Heidi and I have one more day in the flood zone before we fly our Cessnaback to Pemba. So we are up early at the World Vision compound in Morrumbala, loading our Land Rovers and big trucks for a trip to more refugee camps. We would especially like to get to the flooded Shire River and paddle our way in dugout canoes to people stranded on isolatedislands. Our little convoy heads east on a dirt road through the pristine African bush. The mountains and skies are in their full glory, wild, clear and beautiful. Brilliant cumulus clouds perfectly accent the deep blue heavens overhead, hiding a dark fury that has been unleashed on thisland for two months. Heavy rains and cyclones have pounded southeast Africa until now over 300,000 people in this area have been forced from their houses and have lost everything. A thousand feet above the flood plain, the countryside around Morrumbalais poor, but lush, green and relatively dry. We are racing and swerving over the rutted, winding road to make time. We raise clouds of dust,climb hills, dip into valleys, wave to children in villages, and presson to the infamous river. But suddenly we encounter a camp we didn't expect. It is huge. We can't just drive by, so we pull off the road and stop, surrounded by adesperate crowd. They find out who we are, and they are thrilled. Manyof them are already in our churches, and so we start singing and worshiping even as we discuss the situation with their leaders. These people haven't eaten in weeks. The rising waters forced them fromtheir houses along the river plain, and they slogged on foot throughmuddy swamps until they reached high ground and gathered in huge camps. When they arrived they had nothing but the ragged clothes on their backs. The people literally sat on the ground in pouring rain, thunder and lightning with no shelter, food, or visible hope. Children weresick, crying and screaming. Some ran naked like animals. The desperate tried to eat nasty roots and worms out of the ground. Skin and eyeinfections, intestinal disorders, malaria and an array of other health problems began to spread. 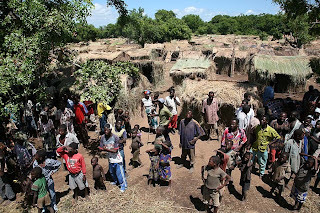 After some days the people began building primitive little huts out of nearby sticks and grass, and now there is a sea of these huts for thesix thousand refugees in this one camp (see the photos!). But still the people sit and sleep on the dirt with absolutely nothing -- no flashlights, toilets, CD players, sleeping bags, cots, Coleman lanterns,tea kettles, bug spray, fans, water bottles or hot dogs. They just wait, tired, hot, dirty, hungry and sick. Our visiting doctor, Koos Le Rouxfrom near Cape Town, begins to treat cases, and says he's never seensuch a needy medical situation. While some of us discuss food logistics, we preach too, and pray for the sick. Terry Inman and Rodney Hogue, pastors from the San Francisco BayArea, flew immediately here to help us minister, and they passionatelypour their hearts out with Heidi and me. No one resists the Gospel.Everyone is eagerly listening to every word, responding to every call,wanting prayer for everything. Many already know Jesus, as we have probably several thousand churches in this one province, but they know they need Him now more than they ever thought. We brought tons of rice, beans, blankets, plastic tarp and othersupplies, but not enough for the whole camp at once. Organizers areafraid if we feed only part of the camp, there will be rioting and bloodshed. But no other supplies have come to this camp yet, and we justcan't take the food away. We are assured other organizations will bringadditional food immediately. Meanwhile, in the hot sun and under trees all around, Jesus is savingand healing. Four deaf people hear this morning. 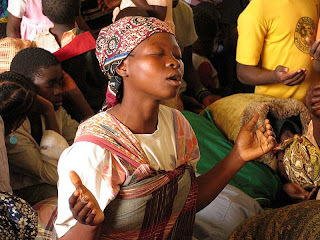 Our own Mozambicanpastors are praying throughout the crowd. We always have good news, we preach. Jesus knows your suffering. Through all of this we will seek Him more, and He will reveal Himself more than we ever thought possible in our lives. That’s the reply I have been getting from a lot of you lately as I share my plans! I feel I must share a little into the background into how God led me to this place in my life. I visited Africa in 1999 and spent a month visiting medical missionary, Rachel Berg, who was my childhood Sunday school teacher. This trip profoundly opened my eyes and I immediately saw all the rewards of going to the mission field. Their simplistic lifestyle and desperate hunger for God left a lasting impact on me. I felt great compassion for them and was just so blessed for having the opportunity to go. Since then, I have always felt that I needed to go back and that God was calling me to serve again in Africa. I fought this calling and blatantly ignored it for long time. I wanted to do things my way. I found most churches to be spiritually “dead” and not at all meeting my needs. I wanted nothing of the tainted “religion” I saw in most churches and in others. So I completely ignored this calling and took my life into my own hands and did things my way. I was determined to have the picture perfect life without having to get up on Sundays to socialize over coffee and donuts in Sunday school. So I led my life the way I wanted to for a long time. It was good and fun at times, but ultimately I found myself beating my head against a brick wall, getting nowhere and becoming bruised and beaten from the self mutilation. I began to ask God to show me Himself. I wanted a God who was real and could change things in my life in a radical way. Things began to change. Specifically, I just slowly started hearing Him in my heart. I started to spend evenings at home reading the Bible, Max Lucado, and anything I could get my hands on. I started to enjoy going home to the peace and solitude of just “soaking” with Jesus. Then I started having dreams. Yes, dreams. Very symbolic, very real dreams. I have had them from time to time in life and am learning more and more how to interpret and know a dream from God. One specific dream occurred several years ago. I was in a large farm house on top of a mountain with a great big tree in the yard with a tire swing. The house had large screened in sleeping porches all around with twin beds against the walls all the way around. Two little girls were running in and out of the porches and they wore their hair in braids. Mom and Dad were there in my dream and I knew we were all in Africa. I assumed the girls were my nieces and Carla (my sister) and her husband were there too. Just a few months ago God spoke to me during prayer with Him and He told me the girls were not Catherine and Gracie, but my own little girls. I can truly foresee this coming to pass. A day when my whole family is with me, living in the dirt in Africa. The dreams continued and I began to study more about dreams and began to see God in an entirely different light. I had known Him as a distant God and had been repulsed by the hypocrisy of the church. When I began to seek Him on my own I suddenly began to see that He is very real, very powerful and very much involved in our lives. He is the same “yesterday, today and forever”. I just started asking for things and started getting answers! Specifically I had to have a change of heart in a given matter. No money in the world, or therapy, can totally change your heart. This has to be a miracle. So as I began to pray, seek and ask, I began to honestly feel a healing of my heart and a complete change in that area. In my reading and studying I kept hearing the names Heidi and Rolland Baker. I heard of them first in a sermon, then in a book, and then I saw a video of theirs on the back table of a church. I bought the video and as I watched Heidi speaking, as I was making Thanksgiving dinner, I instantly felt her heart. She is just a simple blonde-haired petite woman that God called to go to Mozambique. She made the comment, “I’d rather live in the dirt than in Laguna Beach”. That was it! That was what I had been struggling with for a long time. I had wanted something more out of life. Is it my ultimate goal to live in Sea Island, play at the Beach Club and dress my kids in matching seer sucker or do I want more? I wanted more and “the dirt” was exactly where I wanted to go. I had been praying for things to change. I wanted more out of the life I was leading and I desperately needed direction. My heart leaped when I heard her say that because I knew exactly what she meant by living in the dirt and I knew “Laguna Beach” had nothing to offer me. As my quote from Rolland Baker says, “I want to humble myself before God and go lower still along the low road- the only way forward, until I am as desperate for God as the poor in Africa”. I want to show them the God that I know and pour out His love on them. Suddenly things began to fall into place, the mission school and all of that. His provisions continue to show me that I am doing the right thing. I am still very human and a total idiot at times. I don’t know what will happen after this at all. I am far from perfect, but if we wait until we become the ultimate person of integrity and character before we go, we will never get anywhere. So I am just putting myself out there. I want to go and I want to be forever changed. Meanwhile, I just walk in His sufficient grace every single day.